More than a year after the United Nations adopted 17 global objectives for development, known as the Sustainable Development Goals, South Africa is facing increasingly serious hurdles to achieving some of those key targets. The Organization for Economic Cooperation and Development (OECD) has projected that the country’s economy will weaken even further this year from its already-slowed 2015 growth, due in part to political uncertainty and electricity shortages. President Jacob Zuma survived an April 5 impeachment vote stemming from accusations of corruption, and his party, the African National Congress (ANC), suffered significant losses in local elections in August. Almost three-quarters of South Africans are dissatisfied with the way things are going in their country. Overwhelming majorities see many issues, including crime, unemployment and government corruption, as serious problems for their country. Moreover, most of the public says that the government is run for the benefit of just a few groups, and roughly half believe that government corruption will be worse when young people today grow up. Despite this current moment of negativity, though, South Africans display considerable optimism about the immediate economic future as well as prospects for the next generation on a range of issues. A plurality of South Africans want education to be the top priority for their country, and a majority is optimistic that the education system will improve in the future. Similarly, most say that health care and gender equality will also be better by the time today’s children grow up. South Africans are more dissatisfied with the way things are going in their country than they were at any time the question was asked in the past eight years. Whereas South Africans were split on their country’s direction in 2014 (47% satisfied, 49% dissatisfied), 74% now say they are unhappy with the way things are going and only 24% are satisfied. Whites (86%) and mixed-race people, also called “coloured” in South Africa (83%), are more dissatisfied with the country’s direction than blacks (71%). The poor state of the economy may be one driver of the souring mood in South Africa. A large majority (70%) describes the economy as bad, with 45% saying it is very bad. By comparison, about half that percentage (38%) said the economy was bad in 2015. Older South Africans are slightly more likely to view their national economy in a negative light, with 76% of those ages 50 and older saying the national economic situation is bad versus 65% of 18- to 34-year-olds. The pessimistic view of South Africa’s economy is mirrored in individuals’ views of their own economic situation, albeit less intensely. More than half of people (54%) think their personal finances are bad, a rise of 6 percentage points since 2013, the last time the question was asked. Another 44% say their personal economic situation is good. D espite their negative views of the current economic situation, South Africans are broadly optimistic about the future. A full 62% think the country’s economic situation will improve in the next year, with most of those people (42%) saying it will improve a lot. 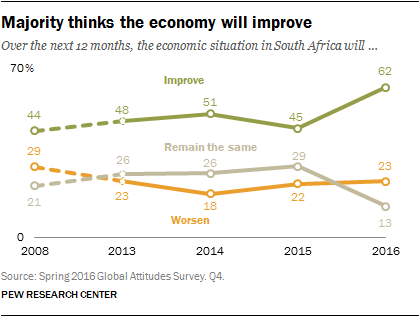 In 2015, only 45% of South Africans believed the economy would get better in the coming year. Older South Africans are less optimistic about the future than younger ones; roughly half of those ages 50 and older (52%) think the economy will improve, compared with a large majority (69%) of those ages 18 to 34. 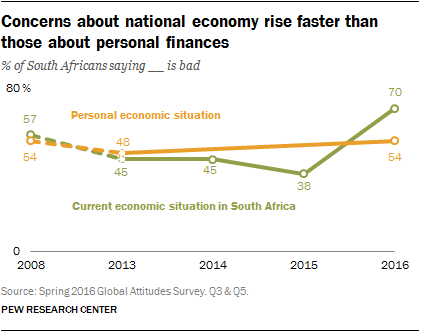 Similarly, 73% of South Africans expect their own personal economic situation to get better in the next year, a significant jump from the 45% who felt the same back in 2013. Black people are significantly more optimistic than whites when it comes to both the national economy (69% vs. 46%, respectively) and their own economic situation (79% vs. 56%). Perhaps due to this optimistic outlook toward economic circumstances, 76% of South Africans would encourage a young person to stay in South Africa in order to have a good life; only 22% would recommend that a young person move away. However, the story is quite different by race. Only 54% of whites and 61% of mixed-race people would encourage a young person looking for a good life to stay in South Africa. A full 82% of blacks say the same. This racial dynamic is reflected in views by political party: Among those who identify with the ANC – 96% of whom are black – an 85% majority says that a young person should stay in South Africa for a good life. This is in contrast to just 60% of Democratic Alliance (DA) identifiers – a much more racially diverse group comprising 35% whites, 24% blacks and 35% mixed-race people. Security, employment and corruption top South Africans’ list of development concerns. At least eight-in-ten South Africans say that crime, lack of employment opportunities, government corruption and poverty are very big problems in their country. Slightly smaller majorities are concerned about health care (75% very big problem), poor-quality schools (74%), the gap between rich and poor, and food shortages (both 71%). Similar percentages express worry about poor infrastructure, lack of clean drinking water and pollution. Two-thirds say that energy shortages and lack of access to clean toilets are very big problems. At the bottom of the list of problems in South Africa is that too few citizens participate in politics – only 43% say this is a very big problem in their country. Compared with 2015, more South Africans express concern today about almost all of the issues tested. The biggest increases were on health care (up 18 percentage points), crime (+16) and food shortages (+15). White South Africans (94%) are more likely than their black counterparts (82%) to say that government corruption is a very serious problem. On several issues, black South Africans are more likely to be concerned than whites or people of mixed race. For example, 74% of blacks see poor infrastructure as a very big problem in South Africa, compared with 53% of whites and 48% of mixed-race individuals. Black South Africans also are more likely than people of mixed race to view energy shortages (70% vs. 51%) and a lack of access to clean drinking water (72% vs. 56%) or toilets (71% vs. 55%) as serious problems in their country. Those who self-identify with the ANC (79%) are less inclined than those who feel closer to the DA (93%) to see government corruption as a very big problem. Coupled with the view that the gap between rich and poor is a very big problem is the view that this gap is increasing. A full 64% of South Africans – and 82% of white South Africans – say the gap between rich and poor has increased in the past five years. An extremely high proportion of the public says the lack of employment opportunities in South Africa is a big problem. A robust 69% say a very important reason for the unemployment rate is that jobs only go to those who have connections. Roughly six-in-ten say that schools not teaching the necessary skills (61%) and people having health problems that prevent them from working (58%) are very important reasons for unemployment. Other major reasons for joblessness include the perception that some people are discriminated against because of their race (57%) or are unmotivated or lazy (50%). Blacks (55%) are less likely to think that racial discrimination in the job market is a significant reason people do not have jobs, compared with people of mixed race (68%). White (67%) and mixed-race (66%) South Africans are more likely than blacks (45%) to believe that laziness is a very important reason people do not have jobs. South Africans are split over whether globalization also contributes to high unemployment. Roughly half (48%) say involvement in the global economy is a good thing because it provides opportunities for growth, while 46% say it is a bad thing because it lowers wages and costs jobs. When asked to pick among six possible development priorities for South Africa – health care, education, agriculture and food supply, the supply of energy, infrastructure and government effectiveness – a plurality (36%) picks education as the top priority for improvement. About two-in-ten (22%) say government effectiveness, such as reducing corruption, is the country’s top priority. Ranked lower are the issues of health care (17%) and agriculture and food supply (12%), while few say energy (7%) or infrastructure (5%) should be the most important priority. 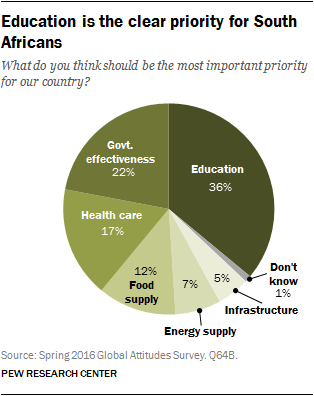 For the second most-important priority, South Africans again highlight education (29%). Roughly two-in-ten mention health care (22%) or agriculture (18%). Another 16% say government effectiveness, while roughly one-in-ten say infrastructure or energy supply. When asked about their children’s future, South Africans are optimistic about education, with 67% expecting it to get better for the next generation. Young South Africans are more hopeful that education will improve (72%) than are those ages 50 or older (60%). Roughly six-in-ten South Africans expect health care (62%) and gender equality (57%) to be better by the time today’s children grow up. South Africans are split in their views on poverty, however – 43% say it will be better while 40% believe it will be worse for the next generation. When it comes to government corruption, views are more pessimistic. Just 33% say corruption will get better, while a plurality (48%) believes it will actually get worse for the next generation. On four out of the five issues tested, blacks are more optimistic than either white or mixed-race South Africans. When it comes to education, poverty, health care and corruption, there is at least a 12-point gap between blacks and the other racial groups – and in many cases the difference is more substantial. Only when it comes to equal rights for men and women do whites, blacks and mixed-race people express similar levels of optimism. South Africans are divided on which country they look to as the best example of an economically developed nation: 27% point to the U.S. and 22% point to China. Other countries like Germany, Australia, Botswana and the UK receive mentions from roughly 5% of the public. Among those who see the United States as the top economically developed nation, a plurality (38%) cites economic opportunities, growth and stability as the reason why. Another 8% cite the U.S. education system and standards as the reason it stands out as an economically developed nation. Among those who choose China, on the other hand, 22% cite manufacturing, production and goods as the reason why. Another 18% say it is economic opportunities that make China the best example of an economically developed country. Contributing to the consistent and pervasive theme of corruption being a serious issue in South Africa is the fact that 70% feel the government is run for the benefit of just a few groups of people. Only 28% say that the government is run for the benefit of all South Africans. 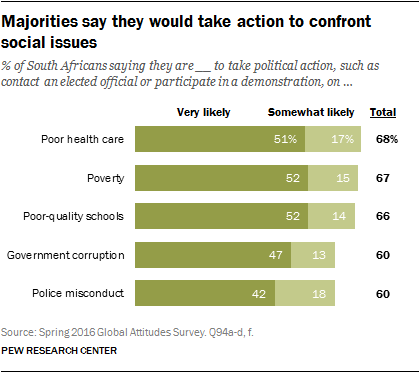 Despite the apparent lack of faith in the representativeness of South Africa’s government, 62% believe that ordinary citizens can do a lot to influence government if they are willing to make the effort. Black South Africans (32%) are more likely to say the government is run for the benefit of all than are whites (15%) or mixed-race people (16%). Despite this, whites (67%), people of mixed race (62%) and blacks (61%) hold similar views on whether ordinary citizens can influence government. Among those who identify with the DA, 82% think the government is run for the benefit of just a few, whereas a smaller 64% majority of ANC-identifiers feel the same. However, those who identify with the ANC are also less convinced that ordinary citizens can do much to influence the government (58%) than those who feel close to the DA (70%). Among a range of possible forms of political participation, South Africans are most likely to say they have voted, either in the previous year or the more distant past (77%). Other traditional forms of participation are also relatively popular, with 39% of South Africans saying they have participated in a political or charitable volunteer organization and 37% saying they attended a political campaign event. The past year has seen an increase in protests in South Africa fueled by political and social unrest. Roughly a quarter of South Africans (27%) say they have participated in an organized protest of some kind in the past, a 12-point increase since 2014. The younger generation, those ages 18 to 34, is 11 points more likely than those 50 years and older to be open to participating in a protest in the future, even though they have not yet. White and mixed-race South Africans (both 85%) are more likely to have voted than their black counterparts (74%). 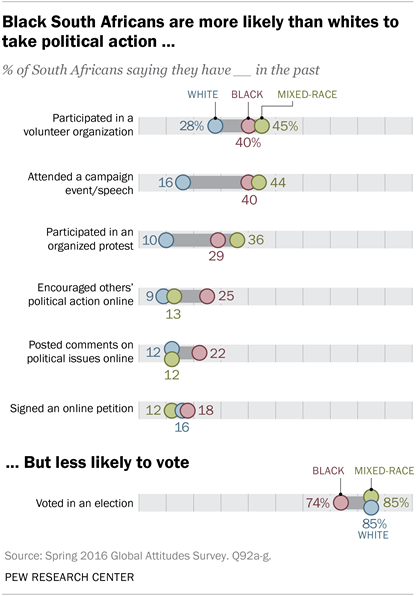 But on other forms of political participation, whites are far less engaged than blacks. For example, only 10% of whites have participated in an organized protest in the past, compared with 36% of people of mixed race and 29% of blacks. A further 16% of whites have attended a political campaign event, a far lower share than among people of mixed race (44%) or blacks (40%). A slightly different racial pattern emerges when it comes to online actions. Among both white and mixed-race South Africans, 12% say they have posted political thoughts online, compared with 22% of blacks. Similarly, blacks (25%) are more likely to have encouraged others to take political action online, compared with people of mixed race (13%) or whites (9%). The issues of health care, poverty and poor-quality schools seem to drive people’s willingness to take political action more than other issues. Roughly two-thirds say they would be likely to take action, such as contact an elected official or participate in a demonstration, to address these issues. Six-in-ten say the same about government corruption and police misconduct. While 52% are very likely to act on the issues of poverty and poor-quality schools, the share that is very likely to take action drops to under half for government corruption and police misconduct.